This is my first post in the New Year, so let me first wish everyone a very Happy And Healthy New Year and then go to today's post. Also, let's start the year on a sweet note, so today's dish is going to be Avarekalu Poli. Last year during the Avarekalu season, I got to taste many dishes made with these beans and Avarekalu Poli/Holige/Obattu was one of them. As usual, I wanted to make it at home, I made it the same way as regular Poli and I used avarekalu/field beans in the filling. Usually I flatten the Poli after closing it with the filling on a banana leaf or plastic sheet, but this time, after watching the guys ( at VV Puram street food ) patting the Poli between parchment paper ( we get Obattu paper here ), I followed the same technique at home. The polis came out super thin and super soft too and the taste was simply too good, do try out this method the next time you make polis..
Add the salt and turmeric powder to the flour, add 2 teaspoons of oil, mix the flour, then adding some water, make a soft dough, knead it for 5 minutes, then pour about 4 teaspoons of oil over the dough, cover and leave for at least 4 to 5 hours. Now let's make the filling, pressure cook the chana dal and the avarekalu/field beans, refer here on how to remove and peel the beans. Drain the excess water from the cooked beans, take it in a blender, add the jaggery, inner pods of the cardamom and the coconut and grind everything together. Heat a pan, add the ground mixture to the pan, and keep mixing till it becomes dry as shown in the picture, remove and cool, now the filling is ready. Now let's make the polis, divide the dough and filling into 8 parts, roll it out into balls and keep. Take a sheet of parchment or wax paper, place a dough ball, flatten it a little, place the filling ball in the middle, cover and close the dough and flatten the ball a little ( see the picture). Now place another sheet of wax/parchment paper or a plastic sheet, then using the heel of your palm, press out the dough as thinly as possible, then remove the paper on the top. Heat a pan, place the pressed poli on it along with the parchment paper, after a few seconds, peel out the parchment paper from the top of the poli . Applying some ghee, cook it, till you get golden brown spots on both sides, remove and serve it warm. The dough has to rest for at least 4 hours, my mom makes the dough in the morning and makes the polis in the evening, they come out really soft. While cooking the filling to make it dry, you can add some ghee, but I didn't add anything. 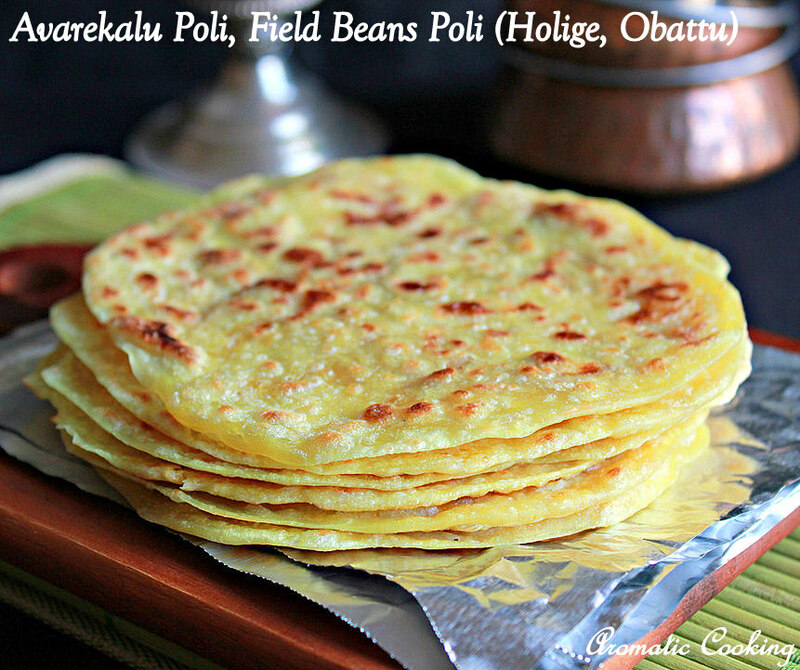 You can cook the poli/obattu/holige with only ghee, or a mixture of ghee and oil. You can refrigerate leftovers, warm it in the microwave before serving. 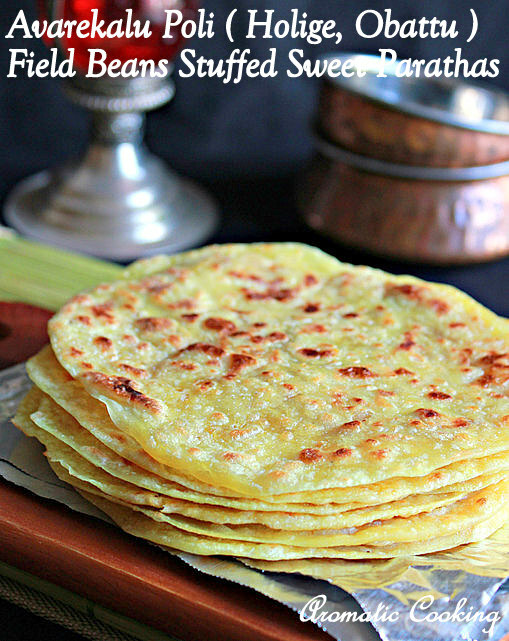 gosh...you have no idea how much I love Indian flatbread!!! These look fabulous, Hema. unique filling love it.. can I have have it pls? Wow! Making a sweet bean stuffed paratha sounds super YUM. Lovely share, Hema. Can you post how avrebele jilebi and jamoon are prepared, please ?